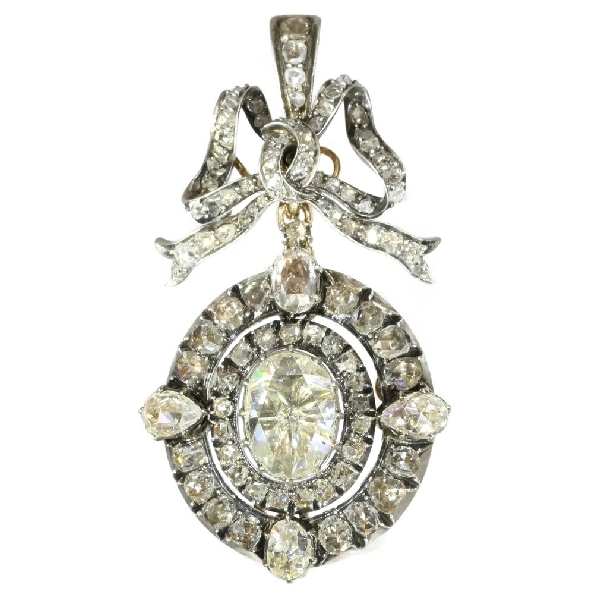 Magnificent Victorian brooch pendant with humungous rose cut diamond: Description by Adin Antique Jewelry. One hundred rose cut diamonds on foil are dispersed over this silver Victorian jewel with an 18K red gold back, which is wearable as a pendant as well as a brooch thanks to skilful crafting. A central grandiose rose cut diamond arises from two terraced diamond ovals just to emphasize your spot in the sun. Surely the endearment for diamonds can be felt from the smallest red gold detail to the darling style of the love-knot bow beneath the loop ring as the suspension of this multifunctional art piece. Antique jewelry object group: Combined brooch-pendant: This jewel can be worn in several manners, as brooch or as two types of pendants. When worn as pendant it can be either only with the loop ring attached to the oval pendant or with the bow between the loop ring and the oval pendant (see the pictures for this). When worn as a pendant, it is possible to easily unscrew the pin of the back of the brooch. And due to a charming hinge system the hook at the back of the oval (that holds the pin when worn as a brooch) can be smoothly clapped flat against the backside of the oval pendant, allowing the jewel to hang smoothly flat. Country of origin: Although it does not carry any legible control marks we believe this to be of French or Belgian origin. Style: Victorian - Victorian decorative arts refers to the style of decorative arts during the Victorian era. The Victorian era is known for its eclectic revival and interpretation of historic styles and the introduction of cross-cultural influences from the middle east and Asia in furniture, fittings, and Interior decoration. Victorian design is widely viewed as having indulged in a regrettable excess of ornament. The Arts and Crafts movement, the aesthetic movement, Anglo-Japanese style, and Art Nouveau style have their beginnings in the late Victorian era. Style specifics: The Grand Victorian Period - Experts divide the reign of Queen Victoria, also called The Victorian era (1837 - 1901) into three periods of about twenty years each; The Romantic Victorian Period (1837 - 1860), The Grand Victorian Period (1860 - 1880), and the Late or Aesthetic Victorian Period (1880 - 1901). We consider this to be of the Grand Victorian Period. This second Victorian period is famous for its ostentatious pieces set with pearls and diamonds (from South Africa). From ca. 1850 wealthy English had reported about jewelry from India and Japan, which heavily inspired the jewelers of this period. This period also corresponds with the death of Queen Victoria's husband King Albert making mourning jewelry (set with heavy dark stones) the type of jewelry specific for this period. Technique: The rose cuts are set on foil. This is a special technique that was used to bring the lustre of the diamonds to its best quality. Diamonds: One truly gigantic rose cut diamond. Though we do not have the weight of this diamond (which is normal in our trade when it comes to rose cuts) we roughly estimate the weight of this carbuncle at an approximate 2,50 to 3,00 carat. The dimensions of this stone are approximately 1,30 cm (0,51 inch) x 0,95 cm (0,37 inch). The quality of this huge stone is high, close to perfect for a stone this age. With the bare eye its looks flawless but with a loupe (magnifying 10 times) one can see a small inclusion at 4 o'clock. The color of this stone is also in the higher whiter regions, but hard to determine because the stone is foil set (like all the stones in this jewel). A modern oval brilliant cut diamond of these dimensions would weigh an approximate 5.00 carat! The big stone is accompanied by no less than 99 rose cut diamonds. We do not have the weight of the diamonds which is normal in our trade when it comes to rose cuts. Note: All diamond weights, color grades and clarity are approximate since the stones were not removed from their mounts to preserve the integrity of the setting. Birthstones: Diamond is the birthstone (or month stone) for April.